If you operate a commercial, industrial facility or warehouse, extreme weather can be a nightmare. The heating or cooling system is chugging away, your employees are uncomfortable, and your energy bills are through the roof. At Ventilation USA we custom design ventilation systems for industrial and commercial buildings. Our ventilation systems reduce negative pressure and solve indoor air quality problems. Installation of KeepTheHeat™ air – air heat exchangers will reduce the need for ambient air exhausters. 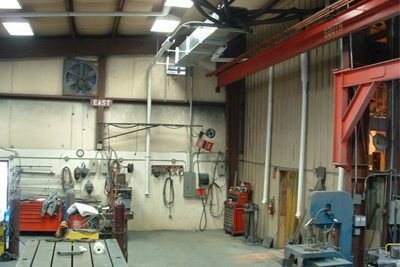 Facilities problems associated with welding smoke, oil mist haze, diesel fumes, carbon monoxide, humidity, and negative pressure have all been solved with custom designed industrial ventilation systems by VentilationUSA. The goals are reduction of energy wasting exhaust fans and installation of Quietaire’s™ un-heated air make-up systems will be the solution; saving energy with air – air heat exchangers. We will custom design any air recirculation unit, Air-to-Air Heat Exchanger, CAP air filters, or air distribution products to allow you to condition and move air to the areas where it is needed. They lower the roof temperature, minimize the amount of heat lost out the roof, establish a downdraft airflow pattern, establish positive air pressure, and most importantly, save you money.